Farley’s Grading and Hauling is a leader in landscape, grading and hauling services. 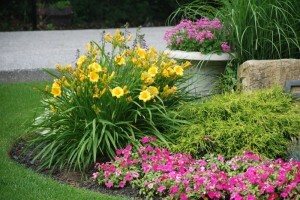 We can bring out the natural beauty of your yard with complete property construction and maintenance. Our staff manages the job from start to finish, handling all phases of site preparation, grading, lawn installation, planting, lawn care, debris removal, etc. If your property needs some curb appeal, or functional outdoor space, we can help you improve the value of your property with suggestions and ideas for the best possible way to achieve the look or space you want. Are you working on a landscape project at your home and need debris removal or landscape material hauled in? We can help you complete your project and let your family enjoy it all summer long. Our emphasis is on customer service, and we can be trusted for honest answers to your questions. We have customers who have been with us many years, a testament to our quality work and professionalism. Our reputation has been built one customer at a time. Our mission is to treat our customers with professional, “Down to Earth” service. Want to support more local businesses? We believe in the whole shop local thing ourselves. Find out more at RaleighSmallBiz.com.